My third son turned 6 years old yesterday, so my husband and I got him the kind of gift that every responsible, mentally-stable parent gives a young child. I'll give you a hint... it rhymes with dumbsh*t.
Of course, the addition of the drum set led me to mentally make over the basement playroom into a music room. How cool would that be? More records on the wall. My kids probably don't have a clue what these are. How weird is that? 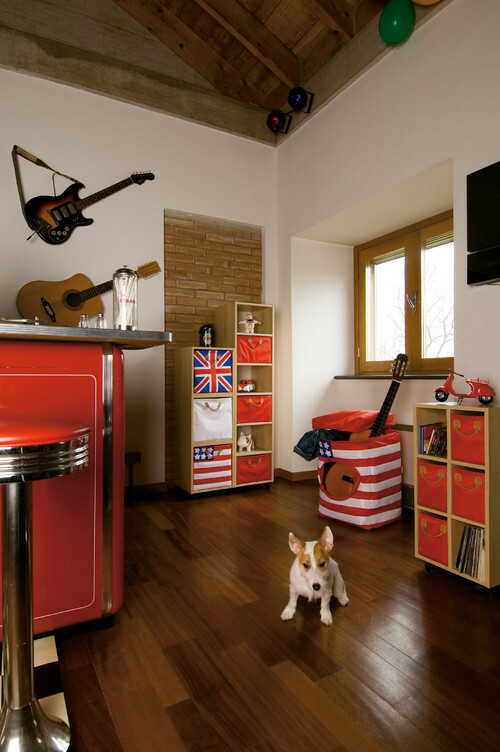 While these rooms are all really cool for kids in the basement, how about decorating other rooms in the house using musical instruments? I not only love the sound of music in a home. I love the look of instruments. For example, check out these lovely pianos. I could have one in every room. 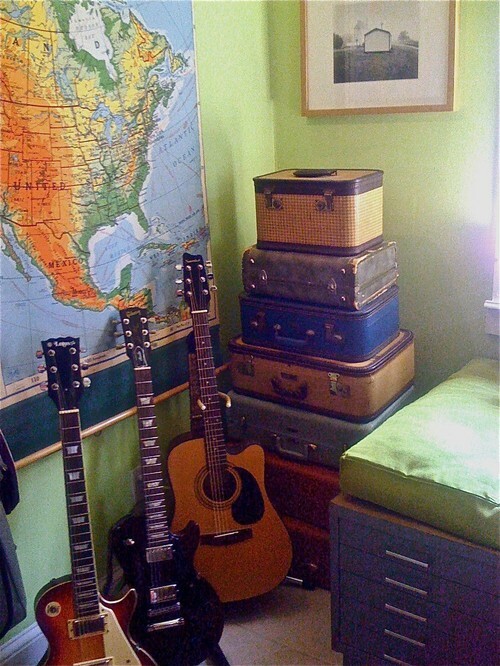 There is something I love about a string instrument hanging on the wall or propped in the corner. If you've spent a lot of money on your kids' drums and music lessons, but he has no interest in becoming the next Ringo Starr, take heart. You can always use the drums for other purposes around your home. I have 2 boys and one of them plays the guitar and he has several in his room. My other one is just learning to play the recorder in music class at school. so, we'll see if music is in his future. They jury is still out on that one. I must say I'm happy that we never had a drum set though. They are so loud! But.....if he loves it and is good at it, then that's all that matters. You can always buy some ear plugs if not. ha! those rooms you featured are really nice. 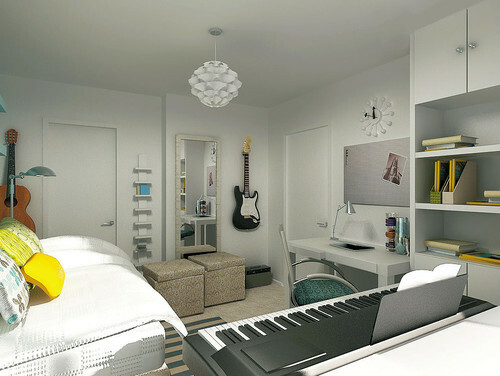 you'll have fun making a music room. Fabulously unusual and creative posr! 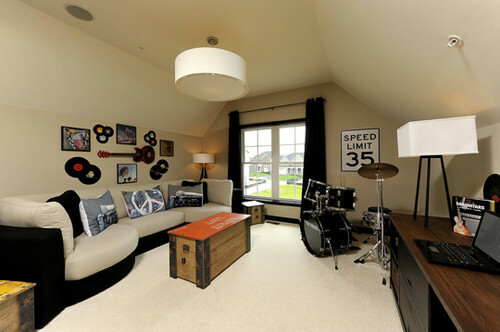 Love seeing all these great ideas for a music themed space. 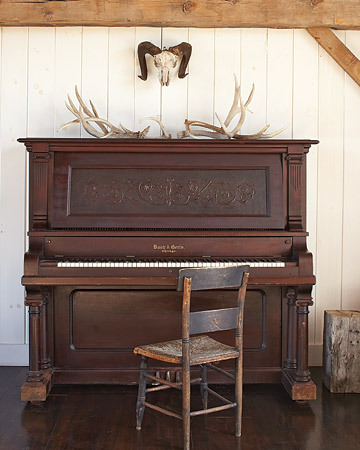 I also love the painted upright pianos. Brings them into the room decor in a mush better way.... with come color! I wanted to respond to your question and see what you have been up to here on your blog, Carolyn! Yes! $20 seems high for a horseshoe. I think something between $4 -7 each sounds normalish. :) New word! You are so wise to give him a musical instrument. I agree wholeheartedly with you in introducing music as opposed to Tv and video games. I don't know about the drum pieces having a second life as furnishings. Is your son getting lessons...that may make it more bearable for you!! Or you can take a lot of showers in a closed tight bathroom!! I love the room with the white piano...that's as close as I'd get to a music room. And no, I don't play an instrument, but have always wanted to learn piano. But I just love the white room!! I made my now 32 year old son wait till he was 12 to get a set of drums. I think he was around nine when he started asking. He is actually very good and was in a Christian band and he does occasionally play for church. I am at his house sitting across from his drums now. What a fun post, Carolyn! My son is an avid guitarist, and I can't wait to share this with him. You're a brave and loving mom to buy your son a drum set! Just think, you will have years to keep on rocking! The rooms are so inspirational! Thanks for sharing at Potpourri Friday!